Cabrueva, a hardwood from Paraguay, contains a flowery sweet wood note which will harmonize nicely with both the wood of the Himalayan and Atlas Cedar. Both these essences contain that ubiquitous wood note. The Himalayan, also known as Tibetan, contains a spice note to its warm woody fragrance and is slightly softer with, like the Patchouli and Cabreuva, a subtle floral note. So you see, I choose my elements so that in the end there will be a harmonizing and relationship from the base, to the middle and extending into the top notes. 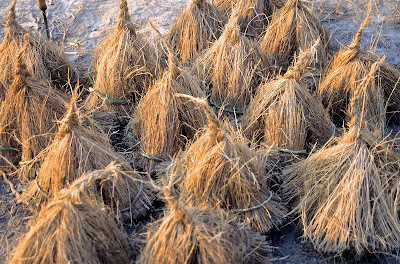 Image of bundled Vetiver courtesy of Christopher McMahon and Manoj Avasthi.